PLANT LIFE How are your botanical skills? We brush up on some of the other plant-based creatures the Doctor has crossed stems with over the years! MAKE A MIRE ROOM GUARD Tired of people rummaging through your stuff? Ashildr shows you how to make your own formidable Mire Room Guard! Get ready to unleash unlimited power on any unwanted snoopers! UNIT ALIEN ARCHIVES And carrying on from this issueâ€™s make we give you the lowdown on the Mire, one of the most feared warrior races in the universe! STRAX AND THE TIME SHARK! More craziness from Grant Perkins as Strax goes undercover on a shopping trip! THE PATERNOSTER GANG INVESTIGATES The Paternoster Gang investigate the Terror of the Thames in a stunning tale from Tommy Donbavand! PETALS Rik Hoskin, Russ Leach and John Burns bring you a chilling tale from the planet Eedâ€™n, where a particularly virulent form of plant life is planning to spread its seeds across the universe! 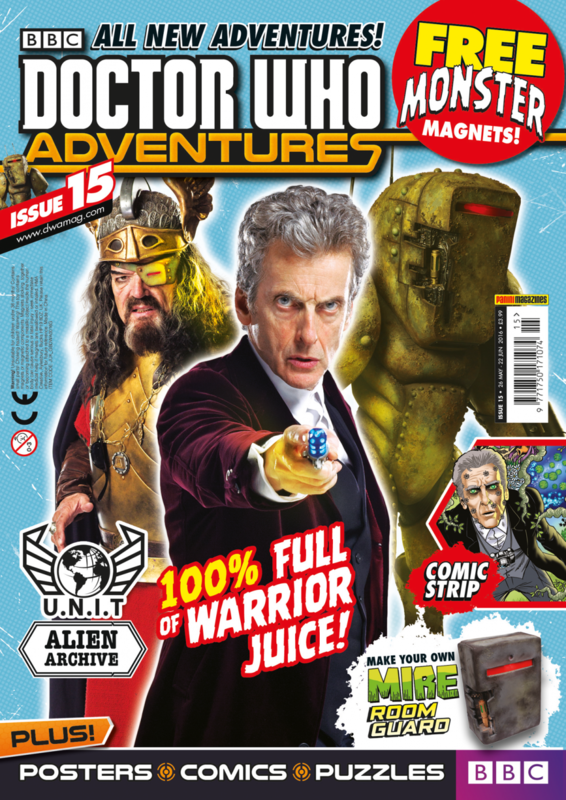 Issue 15 also comes with a set of fantastic free monsters magnets!